Intersolar promotes the development of business opportunities throughout the North American solar industry. There are 800 exhibitors and 22,000 trade visitors expected at the 2011 exhibition, co-located with SEMICON West. The accompanying conference expects 1,600 attendees. 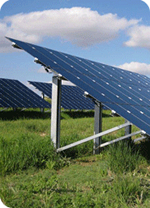 Since its establishment in 2008, the exhibition and conference have developed into the premier platform for the solar industry in North America. Intersolar North America focuses on photovoltaic and solar thermal technology and has quickly established itself among manufacturers, suppliers, distributors and service providers as a vital international industry meeting point. The AltEnergyMag team has taken some time to put together a list of some of the interesting new products and services seen at this year’s show. Click here to visit the InterSolar website for additional information. Trojan Battery Company, Schneider Electric and CentroSolar. Be sure to visit to view and post all the news from this year’s show. The KE maintenance-free slewing drive is lubricated internally with lube-for-life grease, sealed with dual action pressurized seals, and then baked externally with rust and UV proof coatings. The product carries an IP 66 rating, which is protected in any direction from powerful water jets and does not allow any ingress of dust. The final manufactured product is maintenance-free to the buyer for a 30-year field life, thereby eliminating yearly upkeep expenses. Applications include solar trackers, satellite and radar dishes, clean room equipment and marine applications. 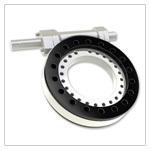 Kinematics slewing drives are designed and tested to last a 30-year field life. All raw materials, components and final assemblies are qualified using the same methods and procedures that earned Kinematics their ISO 9001, CE, REACH and TUV certifications. Powered by hourglass worm technology, these slewing drives offer maximum survivability load-holding, increased efficiency and accuracy, and increased tooth engagement. The Solmetric PV Analyzer is a complete electrical test solution for verifying photovoltaic array performance. For each string, the analyzer measures I-V curves, that is, current and power as a function of voltage. Measured results are compared to the performance predicted by advanced built-in models. This enables greater confidence in DC performance at startup and commisioning, faster installation and repairs, and detailed history of array performance over time. The PV Analyzer measures the DC parameters up to 600V and 20A. The new line of single- and small three-phase Conext Series Grid Tie Solar Inverters features models ranging from 1.5 to 20 kW. Conext inverters are designed to offer improved reliability and a low installed cost through ease of installation and integrated features. The Conext inverter is a proven high-frequency design in a compact enclosure and may be installed as a single inverter, for a single photovoltaic (PV) array, or in a multiple-inverter configuration for larger PV systems, integrating into a complete Schneider Electric solar solution for residential and building customers. KACO has launched a transformerless inverter series like you’ve never seen: High efficiency and best string inverter pricing in the industry for the most popular KACO inverter line worldwide. 96.5% CEC efficiency on all 00xi series inverters ensures lowest energy losses. The easyinstall T-bracket minimizes mounting time to approximately 15 minutes. The inverters produce more kWhs than ever before and they enhance efficiency numbers by using a single stage DC conversion process. KACO has been manufacturing power electronics for more than 60 years with more than 3 GW of inverters in the field worldwide. The CentroRack Solar Mounting Rack Rounds Out CentroSolar America's Out-Of-The-Box 'CentroPack® Grid-Tied Systems for Installers and Dealers. The CentroRack system is engineered as an affordable and easy-to-install system designed that can be mounted on any roofing material. It allows for "slide into place-fastener free" installation of Centrsolar's recently introduced C-Series PV Modules, the sturdiest PV panels on the US market. The CentroRack is made of corrosion-resistant black anodized aluminum, making for a 'clean' aesthetic while providing the durability and ventilation needed for long-term performance. PanelClaw's Gen II flat roof solar mounting systems offer several new features that provide increased flexibility to address varied roof conditions and project requirements. Product enhancements include a new 5 degree tilt option, increased inter-row spacing selections, and enhanced wavy-roof friendliness. All PanelClaw's module mounting claws are UL 2703 certified electric grounding and bonding devices. UL 2703 certification enables PanelClaw partners to ground large array segments with a single grounding device, reducing labor and material requirements and increasing installation speeds for Polar and Grizzly Bear Gen II projects. Polar and Grizzly Bear Gen II deliver superior thermal compensation through the addition of a new a-thermalized deflector and an integrated recycled rubber roof protection pad for both Polar and Grizzly Bear. These features, combined with the existing thermal flexibility of PanelClaw's non-rail based system, provide advanced roof protection and are designed to help PanelClaw partners obtain roofing manufacturer approvals and reduce installation times. Finally no fuses to worry about with these Bentek Solar Circuit Breaker Re-Combiners. These Re-Combiners provide maximum performance and maximum safety with UL489 breakers. The breaker itself serves as a disconnect in addition to providing circuit protection. Designed to provide the final interface to the inverter. Flexible design for customization and ease of installation. Schletter© will unveil the first of its tractor-trailers equipped to service customers installing large commercial and utility-scale ground mount solar PV arrays. The company plans to launch the new program at Intersolar North America, Schletter will showcase the key systems of their ground mount product capabilities. Included in the display will be the tractor-trailer, FS System™, and GAYK™ hydraulic pile driving ram used in the majority of its FS System installations. The company plans to release two tractor-trailers within the US in the coming months. In addition to the FS site testing, the tractor-trailers will be available to Schletter customers for product demonstrations, hands-on training, local workshops, ribbon cutting events and the like. The fully equipped tractor-trailers will be launched alongside the Helios 3D solar layout software for utility-scale system planning. Two new Enecsys Duo micro inverters will be on display – the 360W and 480W models, which support fully independent power point tracking of two connected photovoltaic modules. 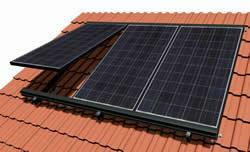 These products enable solar PV systems based on micro inverters to achieve price parity with systems utilizing string inverters. In common with all other Enecsys micro inverters, the Duos are based on a patented design that eliminates life-limiting components, such as electrolytic capacitors and opto couplers. They have a service life of more than 25 years and operate at full specification over an ambient temperature range of -40 to +85 degrees C. Enecsys will also demonstrate its new iPhone app, which provides comprehensive real-time and historical monitoring of solar PV system performance for installers and homeowners.